Last Thursday night was the Fat Stories launch at the Brisbane Powerhouse. It is a free exhibition being held in the Visy Theatre foyer and runs until November 5th. I had just arrived back from Melbourne that afternoon and was in a bit of a fluster trying to work out what to wear to the launch. Ironically enough, at the moment, I am not in the best body positive frame of mind, and having to attend an event where my face is plastered all over the walls with complete strangers staring at it and me was not something I was overly looking forward to. Getting ready in a rush is also bad for anxiety-ridden me because when I’m flustered; I pretty much (internally) go to pieces. Luckily, I was able to get a bit of a calm moment before I went in. I ran into Kath and another friend before I went in and talking to them helped calm me a little. Receiving a lovely compliment on my outfit also helped (hey, I’ll freely admit I’ll take outfit compliments, particularly when I’m feeling unsure about it). Free alcohol at the launch also helped to gird my nerves to enter the arena. The space is a good space to hold the photographs. It’s rather industrial and the stark white framing (I don’t know art terms at all, so forgive me if this is wrong!) contrasted nicely with the background. Besides most of us activists, Issac and Lauren, there were, I assume, partners, colleagues and art type people. And, I presume, other interested parties. The turn-out was more than I expected. It was surreal, to be amongst photographs of myself and I’m sure a fair few times people did a double-take at seeing me on the wall and seeing me in person. I had to laugh and get Natalie to take a photograph of me in front of my photograph. I believe the general crowd response was tentatively positive. Kath gave a great introductory speech which she transcribed over at her blog. I have to agree, I really believe the message of the photographs and I hope it is translated in them. I hope people see the photographs and are confronted. I hope people look at them and appreciate them. I hope people examine their own prejudices and pre-conceived notions of fat people. The project has inspired me and the people involved have contributed to that inspiration. I’m proud of participating. Do you love independent media? Can’t get enough of intelligent, thoughtful feminist content? Want to see writers actually get PAID for their work? Please donate to Lip through Pozible today, and help keep the mag alive! 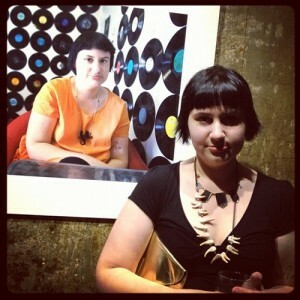 This entry was posted in Opinion and tagged art, brisbane, exhibition, fat, fat stories, fatshion, photography, powerhouse. Bookmark the permalink.